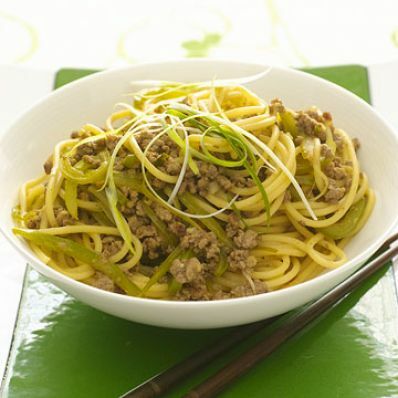 This quick and easy beef and pasta recipe is seasoned with a stir-fry sauce and lime juice. Red pepper flakes add a hint of heat. 1 of 4 Bring a large pot of lightly salted water to a boil. 2 of 4 In large skillet, heat oil over medium-high heat. Add beef to skillet and cook for 6 minutes or until no longer pink. 3 of 4 Add green pepper, scallions, ginger, garlic, red pepper flakes and sugar to skillet; cook for 5 minutes, stirring occasionally. Turn off heat and stir in stir-fry sauce and lime juice. 4 of 4 While beef is cooking, prepare spaghetti following package directions. Drain and add to skillet with beef mixture. Toss to combine.